Rikishi Profile: Mainoumi Shuhei – Giant at Heart. With the undersized Enho knocking at the gates of Makuuchi, Ishiura holding steady at the moment in Juryo, and Ura climbing his way back up the ranks, I thought I’d focus on perhaps the greatest and most popular of all the diminutive, underdog rikishi. Mainoumi stood at 5’7”, and weighed about 215 lbs. However, his actual height was a couple of inches less than that. He gained notoriety even before joining the professional ranks, by persuading a doctor to inject silicone into his scalp, so he could meet the then mandatory height restriction (which has been loosened somewhat since then). As a Makushita tsukedashi, he was immediately allowed to debut in the Makushita ranks, and quickly rose to Juryo in less than a year, making his Makuuchi debut in the 1991 September (Aki) basho, and would eventually last for eight more years in the upper division. You can easily see why he was an immediate fan favorite. The Hawaiian giants had already made their imposing presence felt by the time of his arrival, and his very existence as a sekitori seemed to fly in the face of what, at the time, seemed like an increasing size arms race. Of course, to last as long as he did, he had to almost solely rely on his incredible speed, cunning, and his extraordinary technical skills. His nickname was the “department store of techniques,” and his technical mastery was such, that you’d often see even extremely skilled wrestlers of the time, like Sakahoko and Wakanohana III, seem a bit tentative to get into a pure grappling battle with him. The two most common winning techniques in sumo are: the yoriki (frontal force out) and the oshidashi (frontal push out). In his entire career, Mainoumi only had 33 total wins by yorikiri and amazingly only 3 total wins by oshidashi! By contrast, he won by the rather rare kimarite, kirikaeshi (twisting backward knee trip), a remarkable 50 times. His most common winning technique was the shitatenage (underarm throw), which he won 105 times with, as throws and tripping techniques made up the bulk of his wins. A notable technique that’s often showed in Mainoumi highlight compilations, or television specials, is his use of the kimarite mitokorozeme (triple attack force out), which he’s credited as being the first sumotori to successfully pull off, in the modern sumo era. It’s in his numerous wins against the largest opponents of his time that perhaps garnered him the most admiration, labeling him as a “giant killer,” by defeating a veritable who’s-who list of prominent, gigantic sumotori of the era, such as: Akebono (500+lbs), Musashimaru (500lbs), Susanoumi (500lbs), Toyonoumi (400+lbs), Tatsuhikari (400+lbs), Tochinofuji (400+lbs), Yamato (400+lbs), Daishoyama (400lbs), Kotobeppu (400lbs), Kotonowaka (400lbs), Mitoizumi (400lbs), Shikishima (400lbs), and Konishiki (600+lbs!) who he managed to have a positive 7-5 record in his favor. It was in one of these matches against Konishiki where he suffered a devastating leg injury that subsequently robbed him of some of his speed and mobility, a key factor in the success of his intense, reactive style. He would last for about three more years in the upper division after that, dropping down to Juryo several times, until finally retiring in 1999. Still, it was his incredible heart and determination, and immense technical skill that made him such a beloved and entertaining rikishi to watch. For someone whose highest rank was komosubi, which he only reached once in his career, he’s still brought up and fondly remembered as much any ozeki from practically any era. His legacy is such that any undersized wrestler who’s on the cusp of entering into the makuuchi ranks, is immediately hailed as the next Mainoumi, but from even just a cursory glance at some of his videos, that’s sure to be a gargantuan act for any rikishi to follow. Author sumothunderPosted on November 29, 2018 November 29, 2018 Categories Rikishi ProfileTags MainoumiLeave a comment on Rikishi Profile: Mainoumi Shuhei – Giant at Heart. Rikishi Profile: Takanonami Sadahiro – A Sumo Life Spent Living on the Edge. One of the most unorthodox rikishi in recent memory, Takanonami was a part of the powerful Futogayama heya during the mid-late 90’s, when they were probably the most dominant stable the sumo world has ever seen. He was tall at around 6’7” and although he often did things that were technically wrong in a basic sense–like his proclivity for retreating and moving backwards–he was still able to carve out a very successful career with his unusual and singular style. He was especially famous for his kimedashi (arm-barring force out), or rather, the setup he would utilize once he was being driven back—right often to the very edge of the dohyo. From that seemingly desperate position, he would reach over and lock up both his opponent’s arms, and then steadily begin to march them out, or suddenly swing them around for the win. Using my personal methodology of pure “conjecture-science,” I estimate that he probably spent more time at the edge of the tawara (straw bales) than any other rikishi in modern sumo history. Not only did he spend a lot of time on the edge, but he strangely seemed to be most comfortable fighting from there as well. If that was his sole means of winning, he’d certainly not be as successful as he was, but from that position, he actually had multiple other means of attack. He could use the kimedashi, but he could also abruptly go for the uwatenage (overarm throw), which was the technique that made up the third most amount of his wins at 57. He could also turn and pull his opponents down for the shitatenage (underarm throw) which he won with 33 times. Or, if his opponent responded to try and prevent the kimedashi, he could suddenly focus on one arm for the Kotenage (armlock throw) which he had 67 wins with. He would often also use one of his legs to hook over one of his opponent’s legs, and drive forward for the sotogake (outside leg trip), something his opponents had to be constantly aware of. A lot of his wins that register as yorikiri were initially setup by this awkward retreating arm lock position. Again, this was a highly unorthodox style, and his height and long arms were an essential contributing factor into making it all work. Mitoizumi, a contemporary of his, was also tall and heavy at 6’4” and 400lbs, and won a lot of bouts with the kimedashi as well, but it was by no means the central focus of his attack like it was for Takanonami. To me, it was Terunofuji (when he was healthy) who most resembled him at times, as he pulled off multiple kimedashi wins in a similar manner after first being driven to the edge. However, like Mitoizumi, that was not that main way he wrestled, as Terunofuji had a much more straight-forward, power-based style, and tended to use the kimedashi more as a last resort. Takanonami was an extremely unconventional wrestler who–regardless of the eccentric nature of his style–reached the rank of ozeki in 1994, which he held for seven years, eventually winning two basho championships. After suffering numerous injuries, he lost a good portion of his power, which was vital for his style to work, and was eventually demoted from his ozeki rank. He wrestled on for a further four years after that, finally becoming the last member of his once dominant heya to step down from the upper division ranks in 2004. He passed away in 2015, at the age of 43 from heart failure, having reportedly had a possible heart condition even while he was still wrestling. Yet, it was the memorable way he wrestled, and the success he garnered with that style, even while doing a lot of things technically wrong, that truly made him an unforgettable, one-of-a kind sumotori. Author sumothunderPosted on November 8, 2018 November 27, 2018 Categories Rikishi ProfileTags TakanonamiLeave a comment on Rikishi Profile: Takanonami Sadahiro – A Sumo Life Spent Living on the Edge. 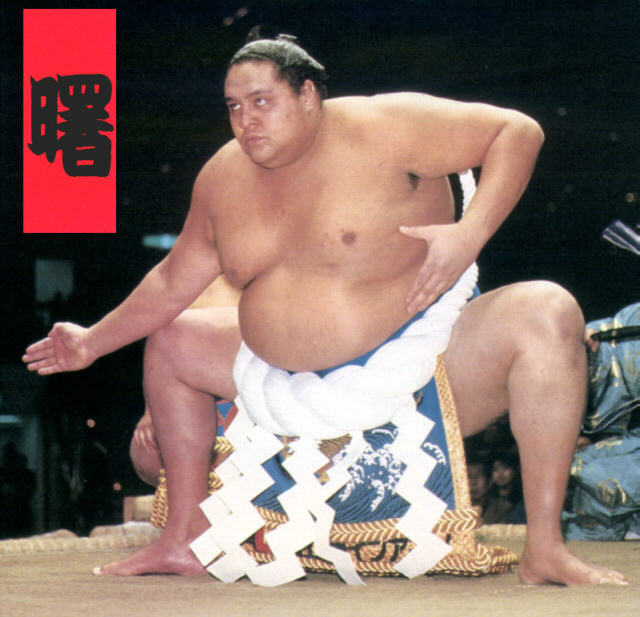 Rikishi Profile: Kirishima Kazuhiro – Perhaps the Greatest of the Sumo Power Lifters. He was a fitness freak, who would run before sumo training began, and then lift weights afterwards. He was also very undersized at around 280 lbs. Imagine someone who was around Harumafuji’s size (10 lbs. less in fact! ), who instead wrestled with a strength-based, power style like Terunofuji. Rikishi were already big by that time too during the 80’s – early 90’s era in which he wrestled (around 15-20 lbs. smaller overall than today). He certainly wasn’t as strong overall as Baruto, Tochinoshin, Terunofuji or Akebono, and he didn’t get the sheer “air time” on his lift-outs that Tochinoshin does, but I personally consider him the greatest pure lifter in recent history at least, because of how small he was, and the fact that nearly all of the opponents he lifted out (besides Chiyonofuji) often outweighed him by 30-80lbs or more. Author sumothunderPosted on November 6, 2018 November 27, 2018 Categories Rikishi ProfileTags KirishimaLeave a comment on Rikishi Profile: Kirishima Kazuhiro – Perhaps the Greatest of the Sumo Power Lifters.